Since the unexpected oil price crash in 2014, and the stubborn refusal of the markets to push oil prices much above $50 per barrel, the oil industry has resorted to the equivalent of whistling in the dark. Industry press releases result in glaring headlines announcing the discovery of another century of oil. To the casual reader, and especially the casual investor (you know, like the guy who is paid to look after your pension pot) this creates the impression that all is well. However, look behind the headline and you discover two sleights of hand. First, oil deals in big numbers. Last year, global oil production averaged out at a little over 98 million barrels per day – that’s a staggering 35.7 billion barrels a year. So unless a new discovery involves a quantity of oil that can be measured in billions of barrels, it is of little consequence in the grand scheme of things. And that, of course, is a real problem for Big Oil just now, because the number of new discoveries is at its lowest since the 1950s, and the size of each discovery is at an all-time low. To put it another way, we are finding less oil in smaller – and therefore more expensive – fields. The second sleight of hand is far more dangerous. The oil industry regularly blurs the difference between resources and recoverable reserves. To most readers (and many investors) this sounds like semantics. But in law, these terms have specific meanings. The resource is an estimate of the total amount of oil in the ground. But, subject to geology and technological limits, only a proportion of the resource can actually be recovered. And the more a field depletes the more energy and money it takes to get the remaining oil to the surface. Eventually a point is reached when it costs more to get at the remaining oil than it is worth. For investors, the number that matters is the recoverable reserve. This is the amount of oil that the company reasonably believes can be recovered given the current price. Obviously there will be some variation when prices fluctuate, so when a company reports its recoverable reserves we need to look at the predicted price that the figure is based on. As an aside, increased activity in the US shale patch, particularly in the Permian Basin, has caused forecasters to lower expectations of prices above $50 at least in the medium turn. Moreover, any slowdown in the global economy is likely to result in lower demand in the USA and Europe, leading to more oversupply and a return to lower prices. Remember how we need to deal with big numbers when it comes to oil? Well that 100 million barrel resource is small change. Even if we could get it all to the surface, it amounts to just over a day’s supply. Not to be sniffed at, but not the game-changer implied by the headline either. And note that seemingly innocuous term oil equivalent hidden in that statement. That refers to what is otherwise called ultra-light oil and gas condensates. It has its uses, but sweet crude oil it most definitely isn’t – think of it as being closer to the fuel used in a cigarette lighter. This matters because since the advent of fracking, the world is awash with ultra-light oil because many refineries cannot process it and its uses are limited. Suddenly, that extra day’s oil supply might struggle to get us through to tea time. This is not the thrusting industry of the 1950s, striding the globe as it opened up new frontiers. This is an industry in decline. No longer prepared to open up new frontiers, but resorting to draining the final dregs from regions where it already operates – where access to equipment, supplies and skilled labour serve to hold down costs. This is not to imply that the world is going to run out of oil anytime soon. But that is not the point. 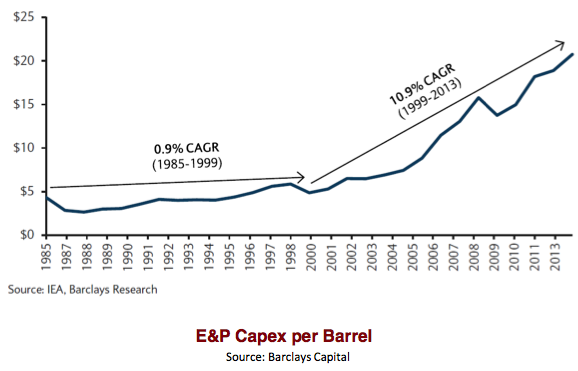 What it means – and this is observable in capital expenditure figures – is that since conventional crude oil production peaked in 2005, it is getting more expensive and technically challenging to maintain growth in production. From an environmental perspective, this might sound like good news. But from an economic perspective it is devastating. The centrality of oil to just about every human activity in the developed and developing economies means that without increased oil production we cannot have economic growth. Yes, we can tinker around the edges by swapping out oil from electricity generation and home heating in favour of renewables. But this has huge costs (including oil in the manufacture, transportation, deployment and maintenance of renewable technologies) for a relatively small saving (it is primarily coal rather than oil that is being replaced). There will come a day – not that far in the future – when the amount of oil (and oil equivalents) coming out of the ground is more than the day before for the very last time. After that day, the world will have to get by on less. The trouble is that nobody knows how to do that. All of our political and economic theories since the dawn of the industrial age are based on the assumption that we will always have more energy tomorrow than we had today. Most likely, we will have to focus an increasing proportion of our economic activity into energy production in order to maintain as much as we can of our civilisation. But, without economic growth – which can only result from energy growth – this will become a fixed sum game. The additional capital, labour, resources and energy diverted into producing/generating further energy will have to come from elsewhere in the economy. This, I’m afraid, is why we should care. Because it means that a whole host of things that we used to be able to do are going to go away. This, in turn, is why we need to get past the whistling in the dark headlines and start engaging in a serious discussion about our energy future.